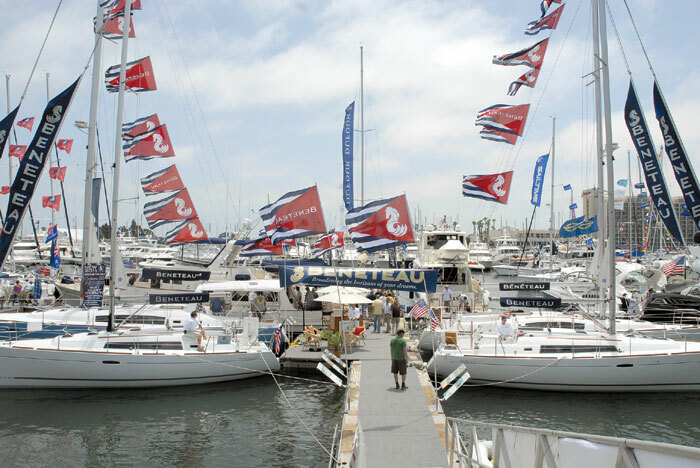 SAN DIEGO — Prospective boat buyers and current boat owners came out in droves for the 2013 Progressive Insurance San Diego International Boat Show in June, with this year’s reported attendance up 26 percent over the previously held summer show. The addition of educational seminars and trailerable boats helped drive up the attendance numbers, according to the show’s producer, the National Marine Manufacturers Association (NMMA). Held June 20-23, the show attracted a total of 6,332 visitors to the Sheraton Harbor Island and Spanish Landing Park, where more than 100 boats were on display in the water — including, for the first time, several superyachts. Early statistics show that 60 percent of people who came to this year’s show also attended last year’s show, said Dave Geoffroy, vice president of NMMA. “The good news is that they like the product, and came back,” he said. Trailerable boats, more gear and accessory booths, and additional educational seminars were also attractions at this year’s show. Show-goers were able to experience on-water sports at Try It Cove, relax at the Bay Club Lounge or get out on the water in At the Helm boating courses. Geared toward expert mariners and beginners alike, the classes were designed to help potential boat buyers figure out how to best get involved in boating, and what activities were best for each family. “We invest heavily in consumer and boating education and consumer interactive things,” Geoffroy said. The show, formerly called the San Diego Yacht & Boat Show, was produced by the NMMA in partnership with the California Yacht Brokers Association and the San Diego Superyacht Association.